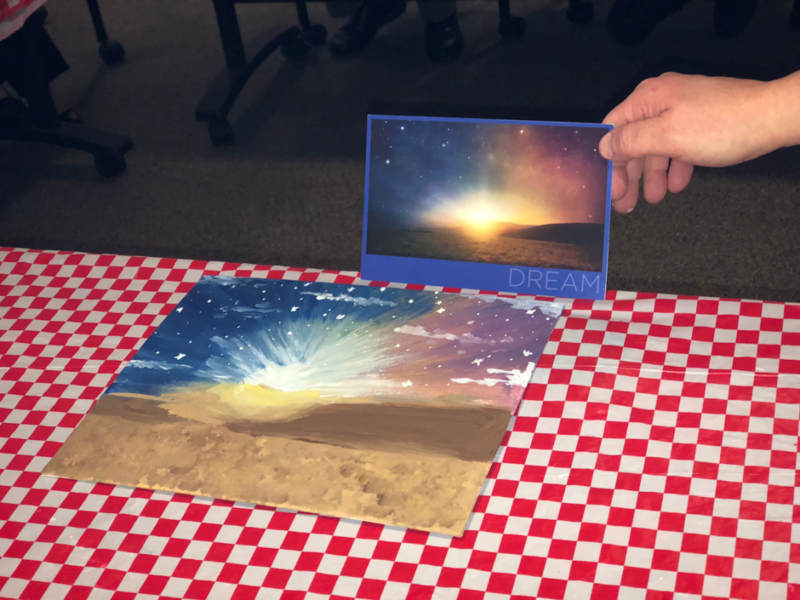 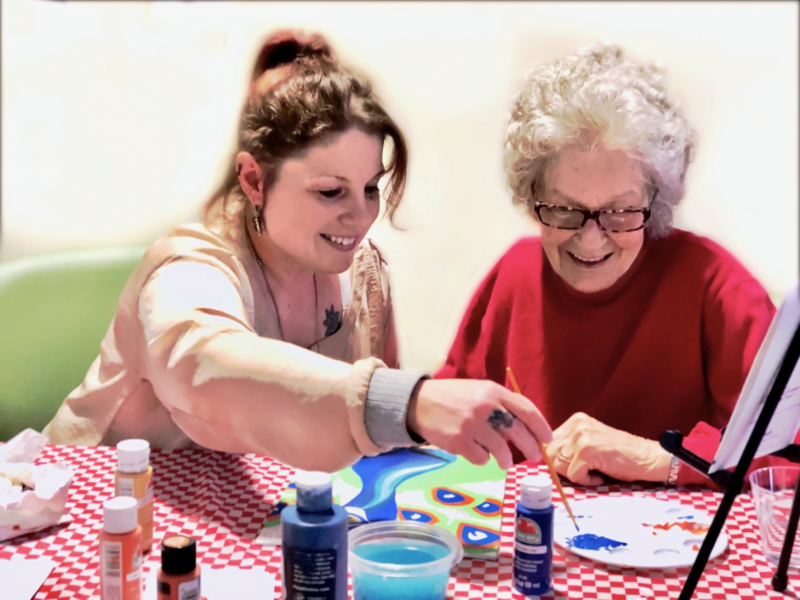 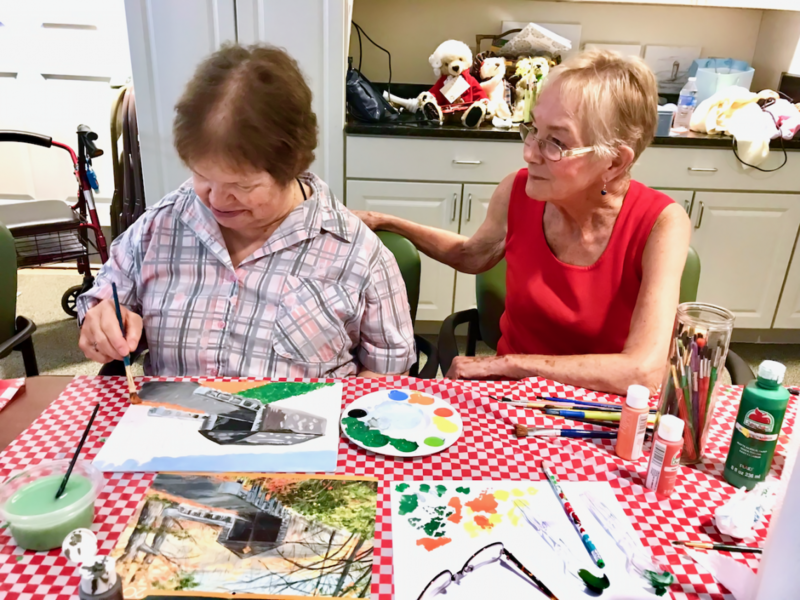 All across the Cedar Hill campus, our residents are busy painting, pasting, and creating – feeding their souls and touching those of staff and visitors. 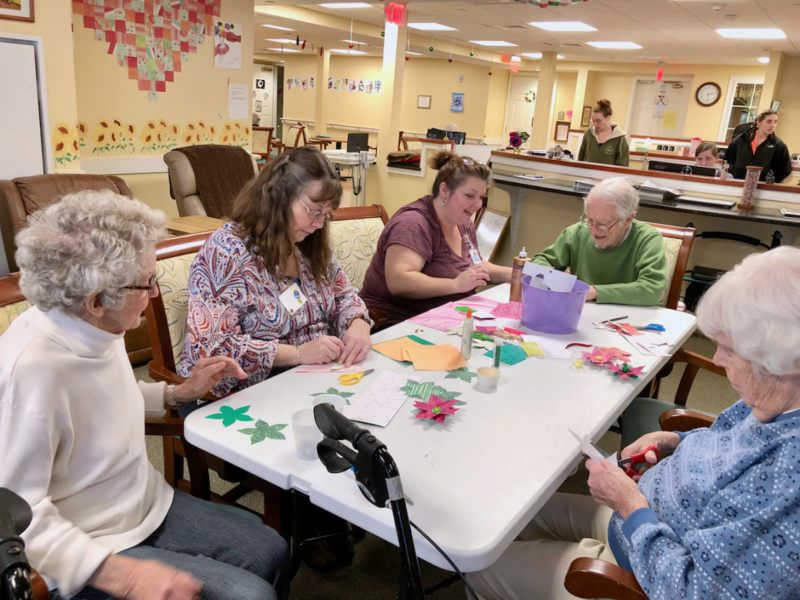 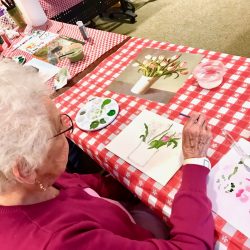 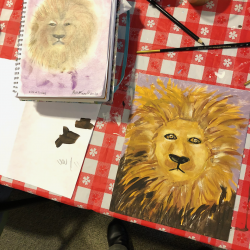 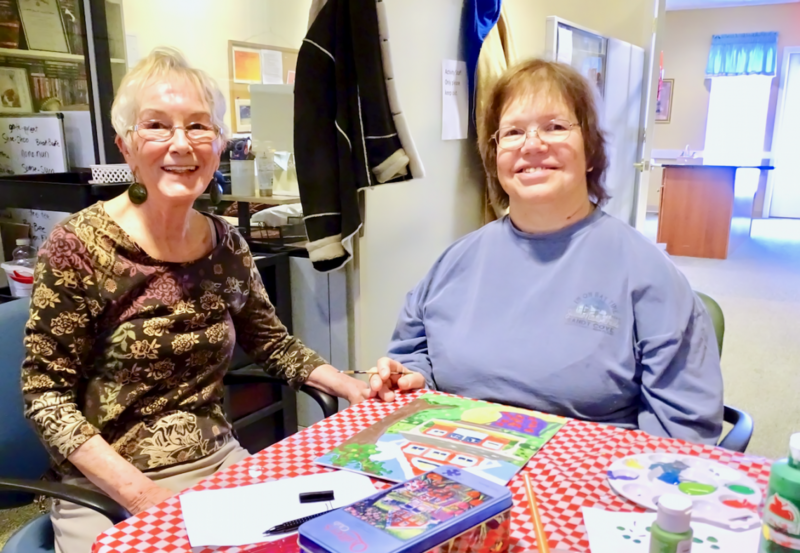 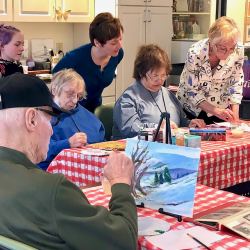 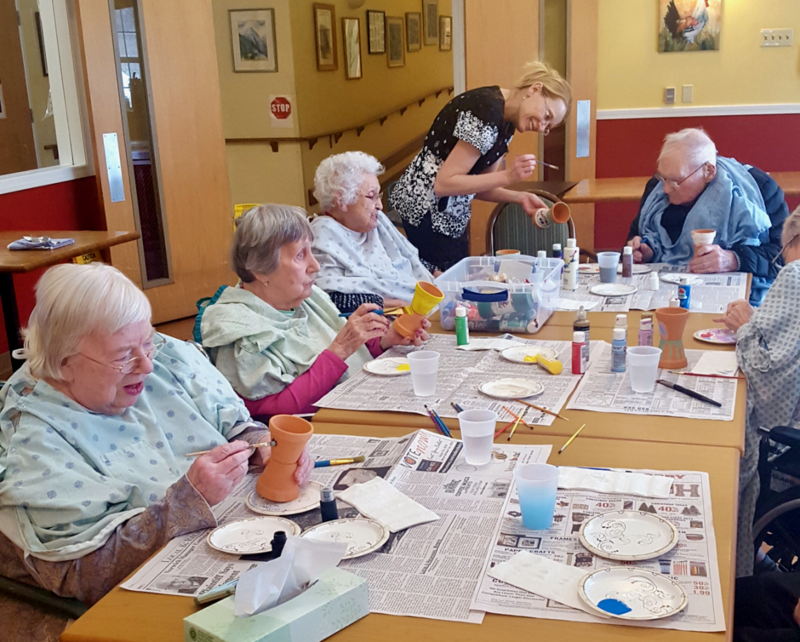 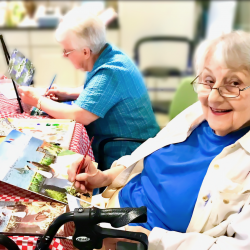 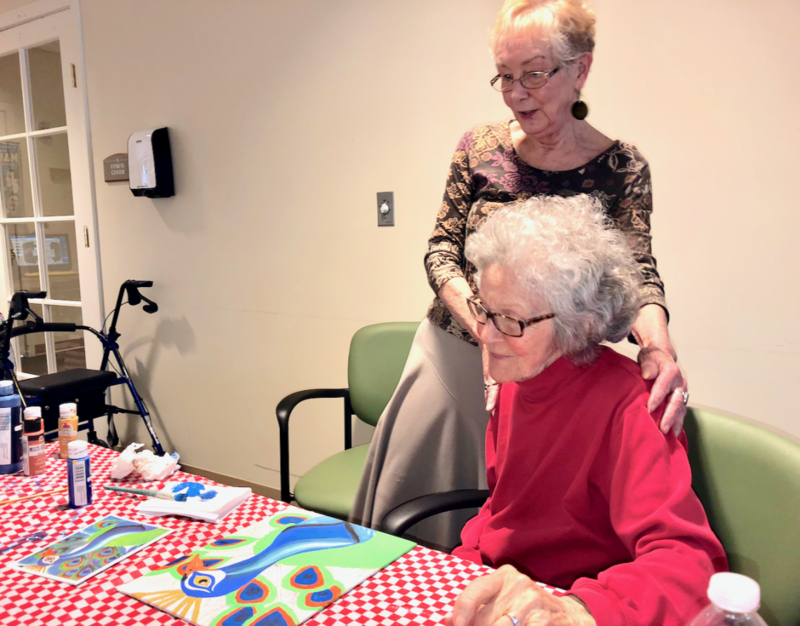 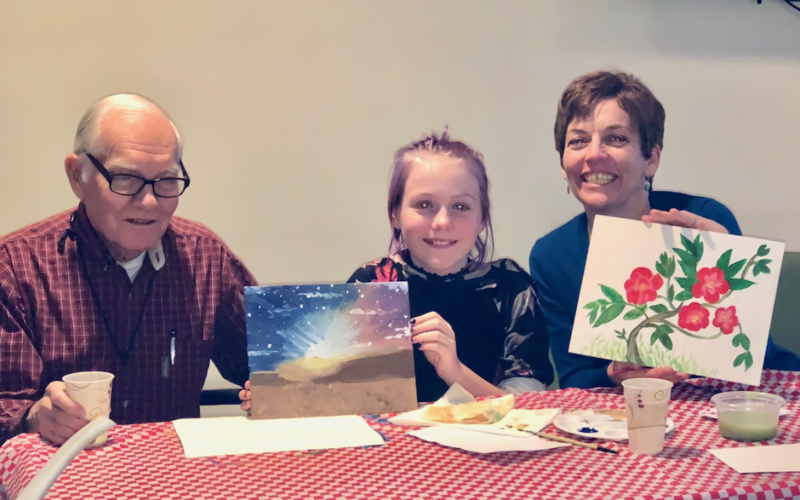 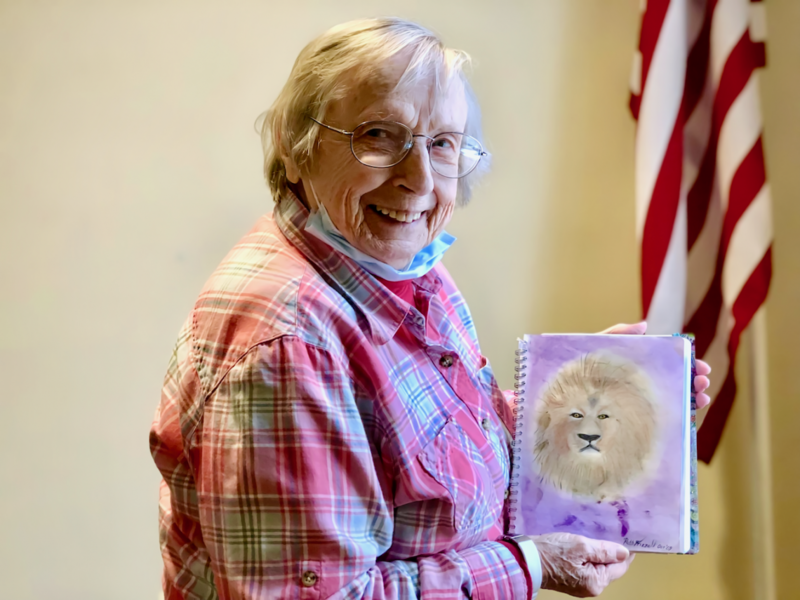 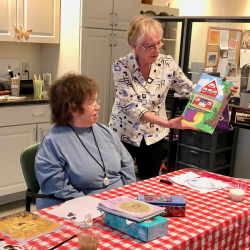 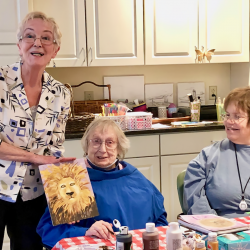 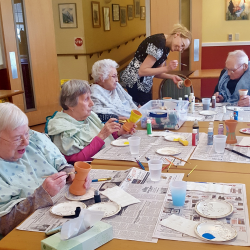 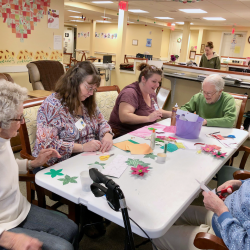 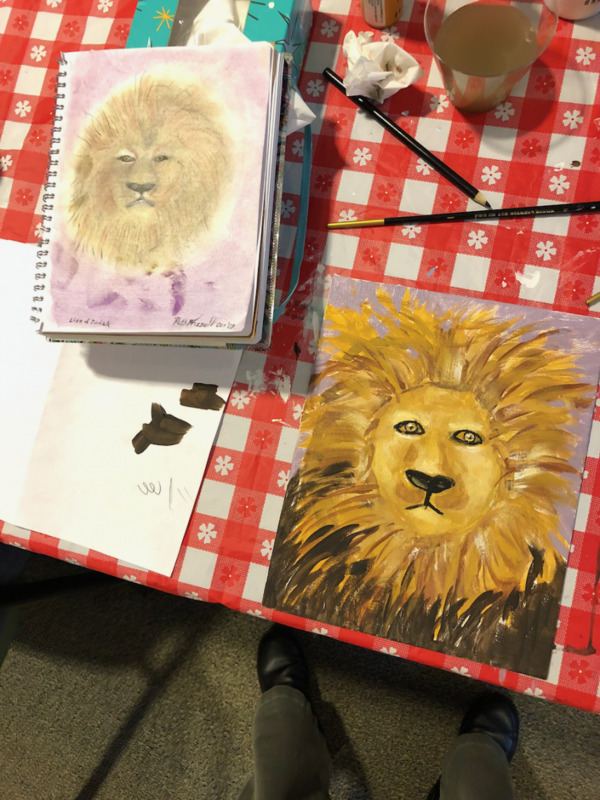 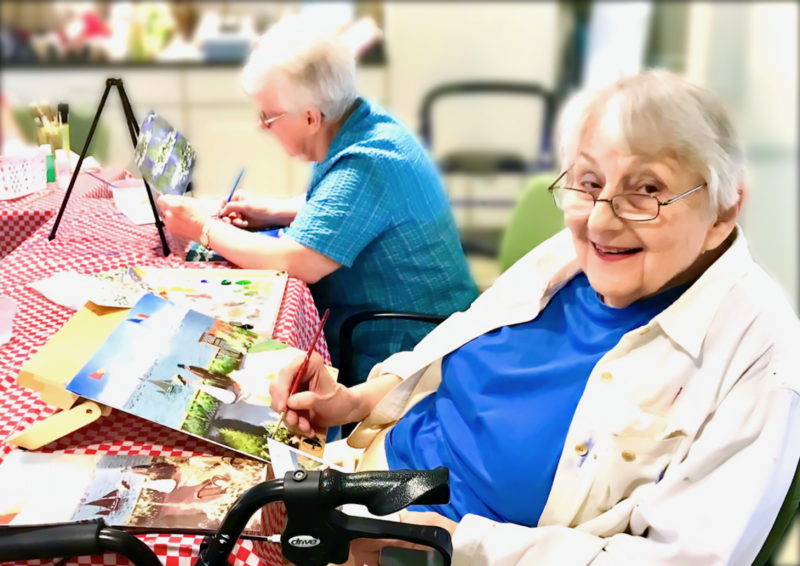 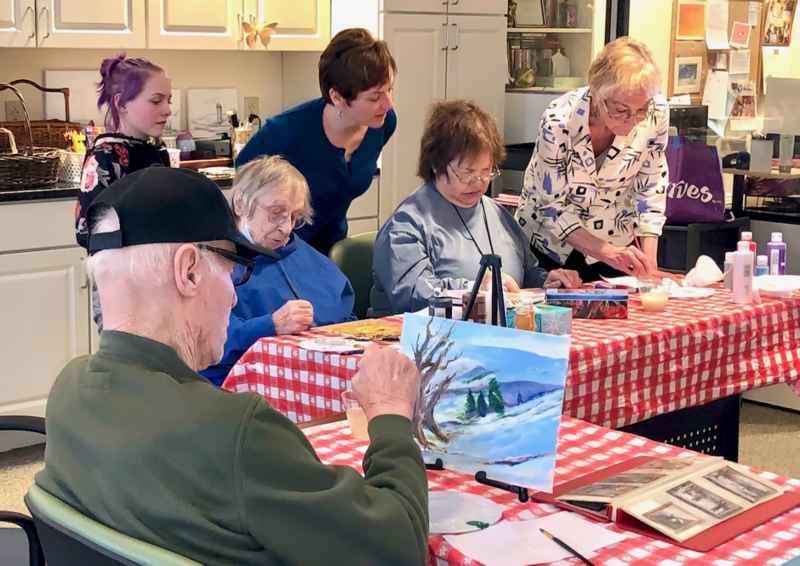 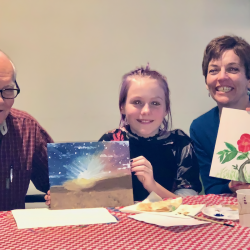 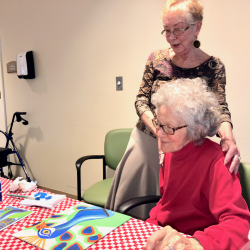 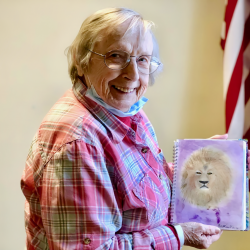 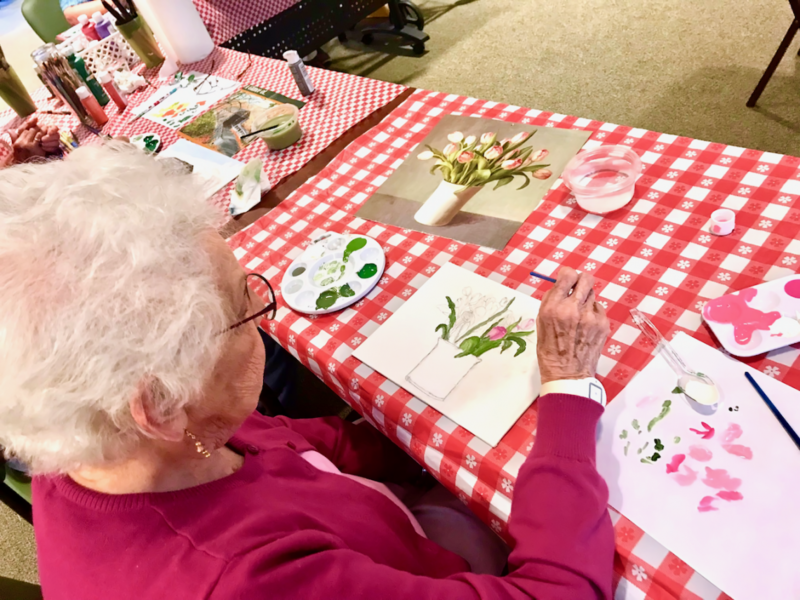 At The Village, the weekly art class is led by Kathleen Eames, who was the Director of Social Services at Cedar Hill Health Care for 13 years. 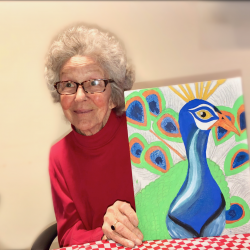 An artist herself, she started art classes for residents before she retired. 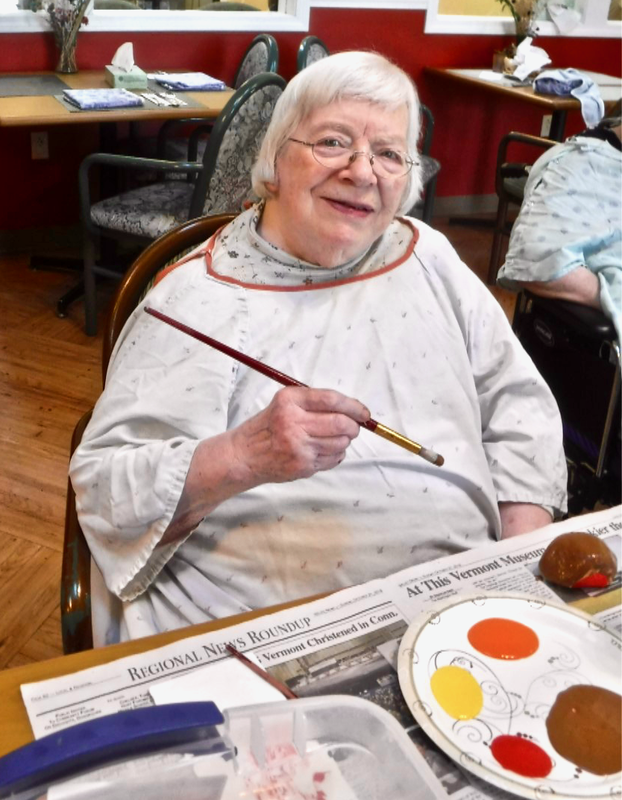 “One day I sat in on an art class with the residents. 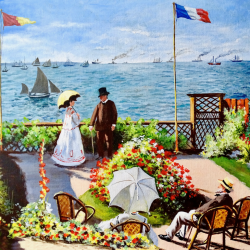 Well, one day became three days, and three days became 10 before it turned into a weekly thing,” she said. 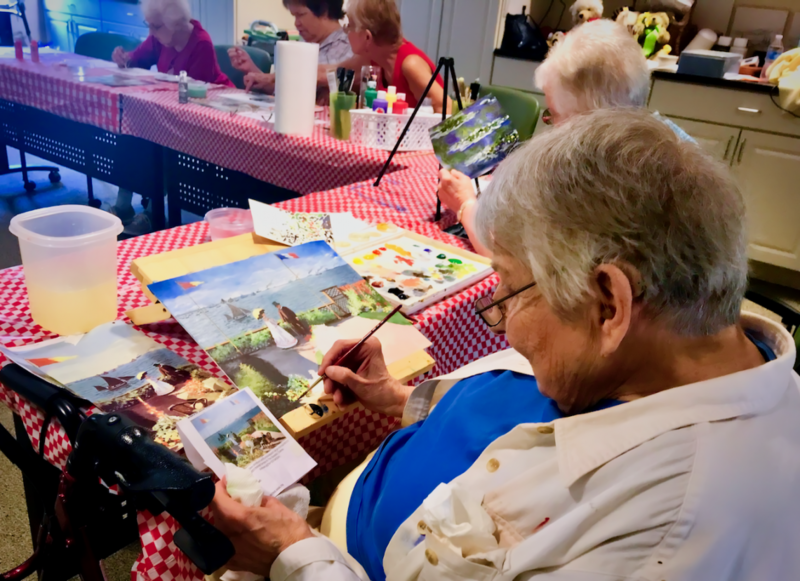 After her retirement, Eames received a phone call from owner Mary Louise about teaching an art class at the Village, and so it began again. 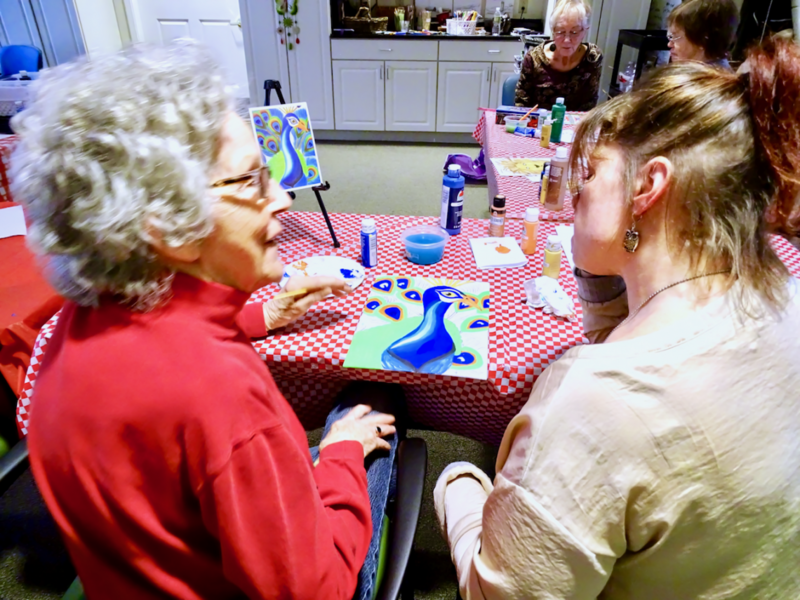 Every Wednesday Eames teaches a collaborative art class. 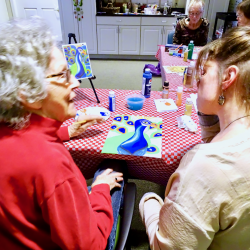 The room swirls with the colors on the canvases and in the palettes. 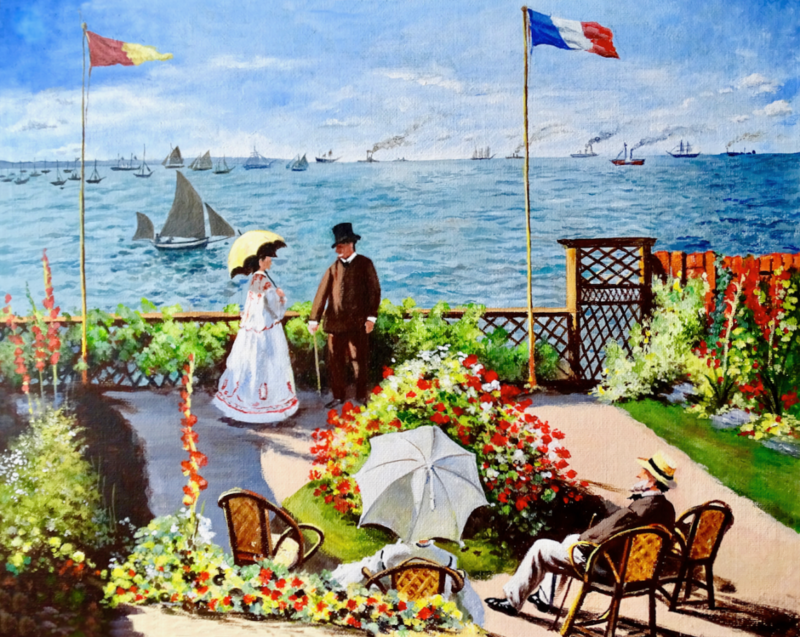 Many of the painters work from another painting they choose, recreating it. 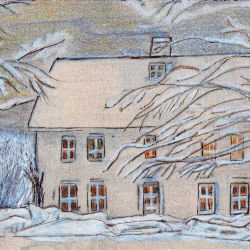 Others sketch out their own. 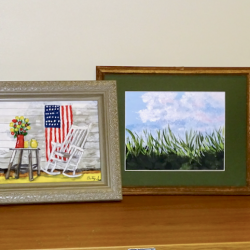 Many of the finished works will be for sale at the Cedar Hill Art Show on May 12th. 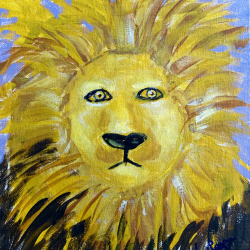 Proceeds will benefit the entertainment fund which brings in musicians and other entertainers to the campus. 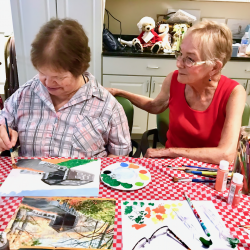 The Village artists are also creating a 2020 calendar of their artwork to sell to benefit the entertainment fund. 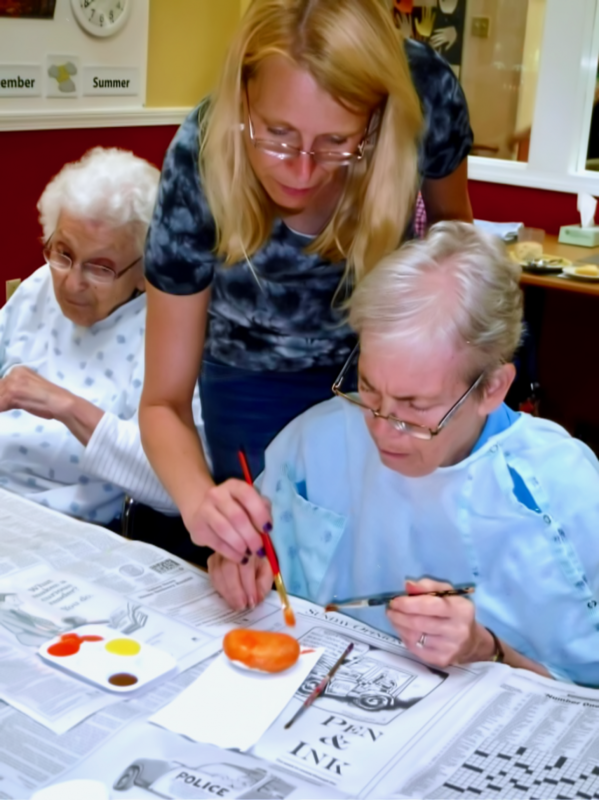 Working at arts, crafts, and other creative projects benefit people of all ages. 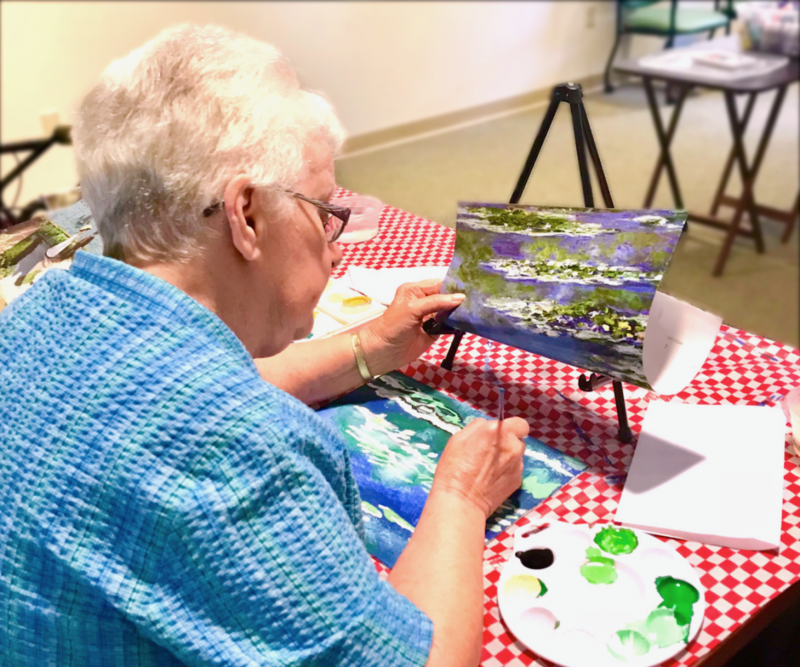 For seniors, it helps keep the brain healthy and can alleviate anxiety and depression. 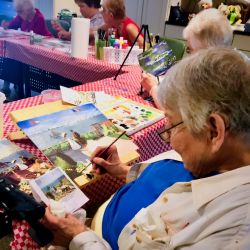 Creative activities such as writing, painting, or knitting encourage a sense of competence, purpose, and growth – all of which contribute to aging well and personal happiness. 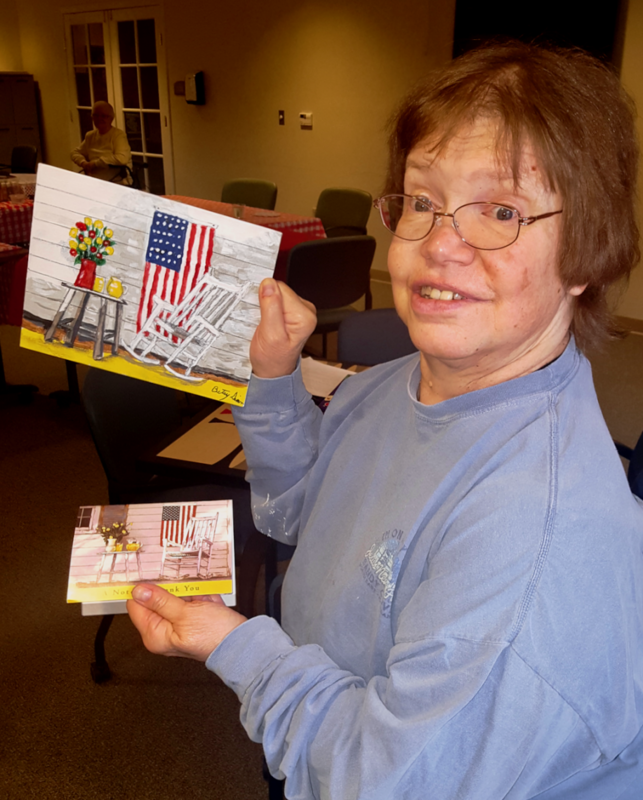 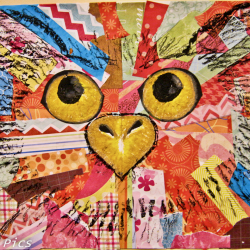 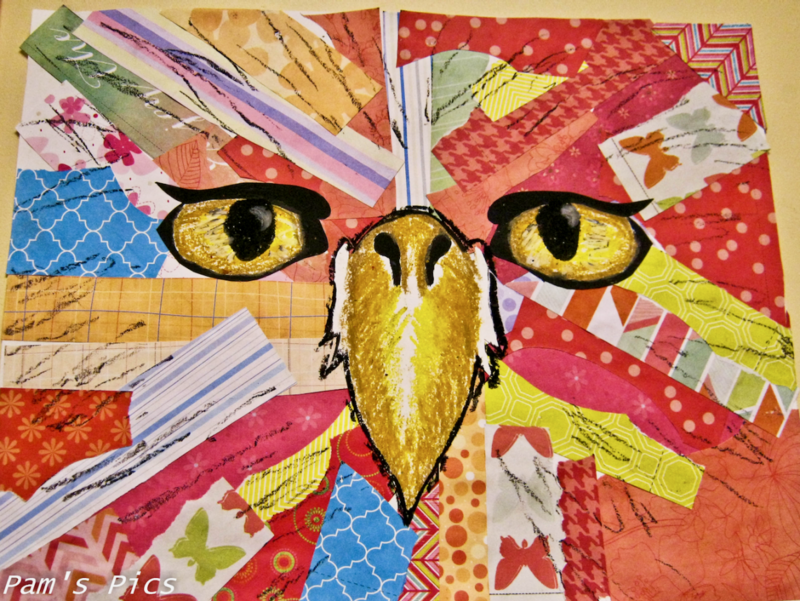 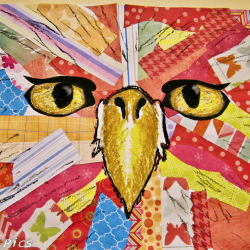 Painting, assembling collages and making crafts is soothing work and when done as a group encourages community. 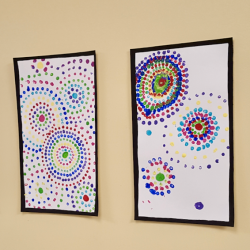 And who doesn’t like seeing their creations hanging around them? 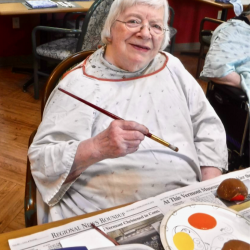 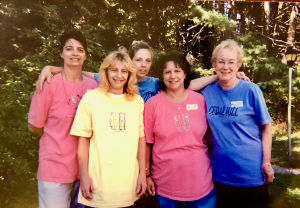 The Judith Brogren Memory Care Center’s Activity Director Pam Crosby was a kindergarten teacher for 13 years. 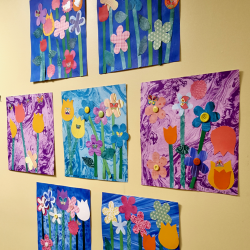 Arts and crafts were an integral part of her curriculum. 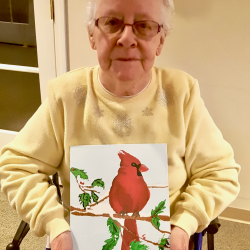 Fine motor skills, language development, social skills, art appreciation and a means to express oneself are all contained within one project, she explained. 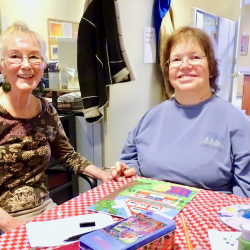 “ These concepts apply to everyone regardless of age or mental status,” she said. 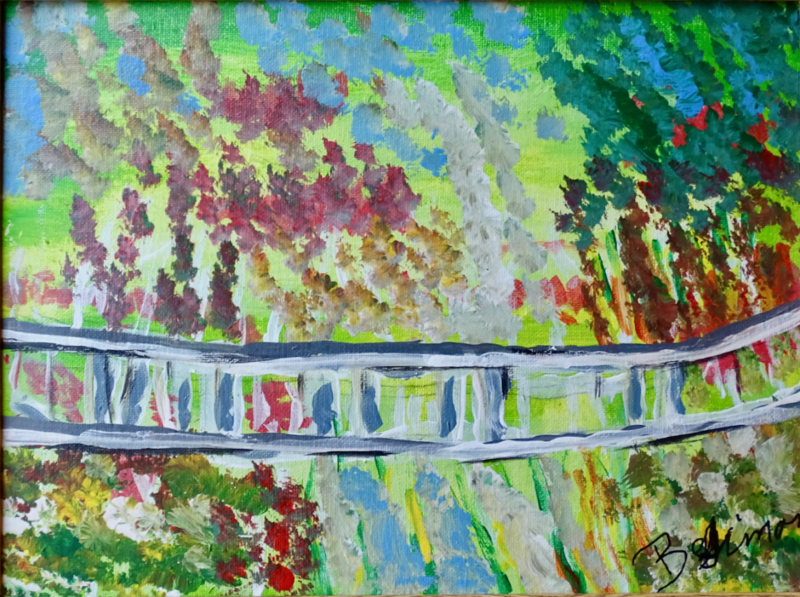 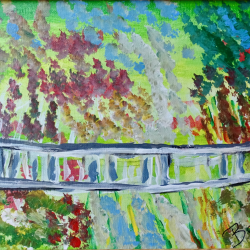 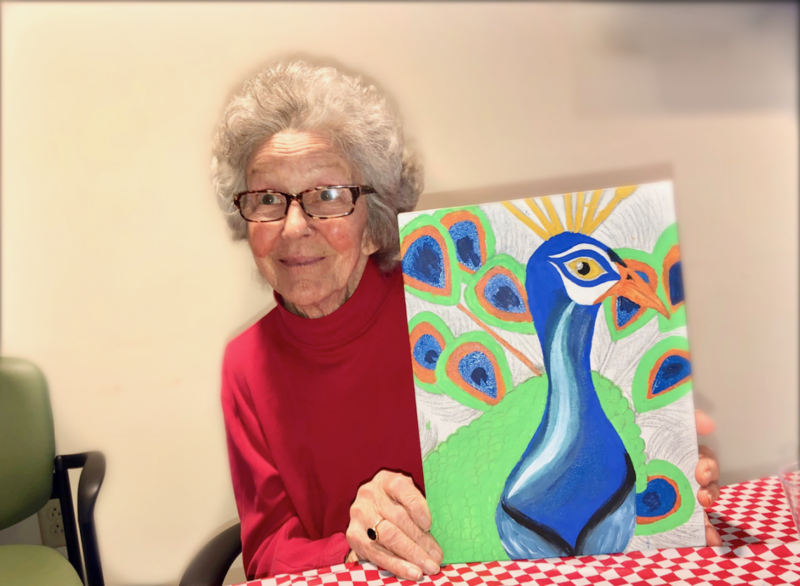 Art helps preserve the Memory Care residents sense of self. 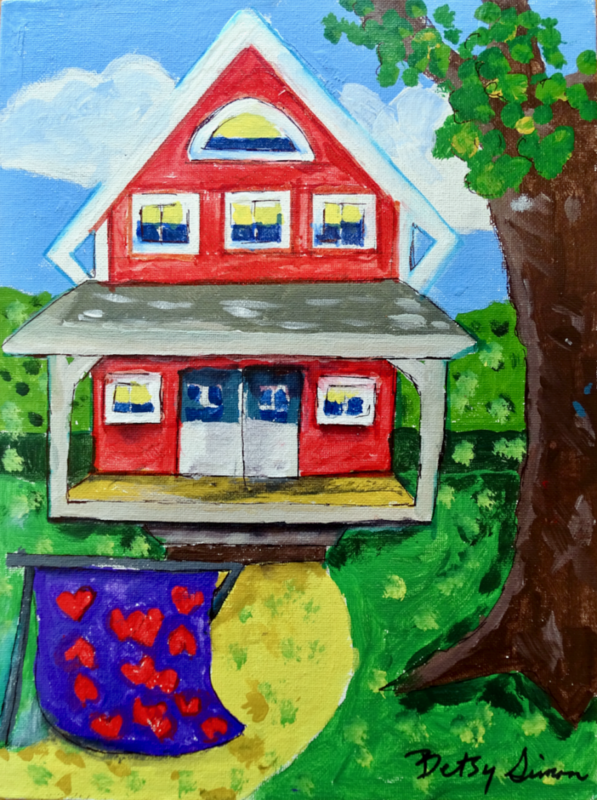 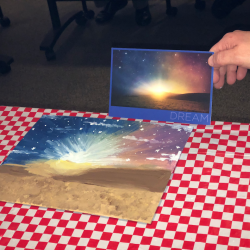 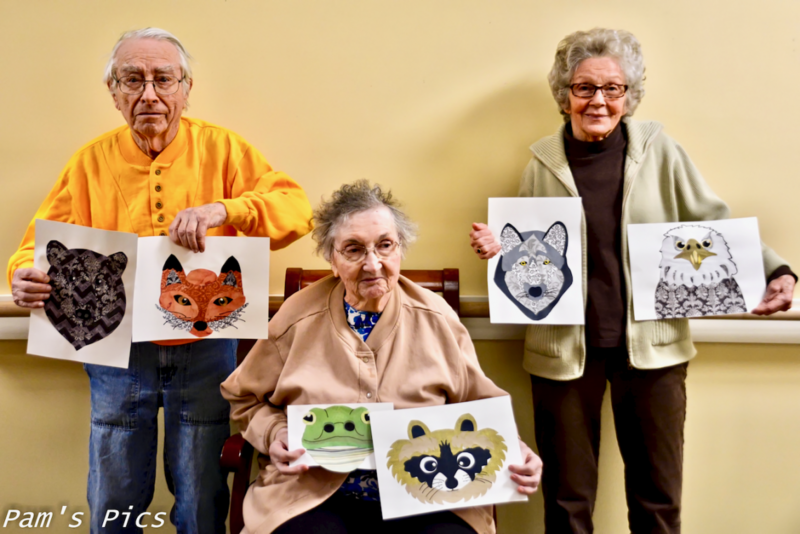 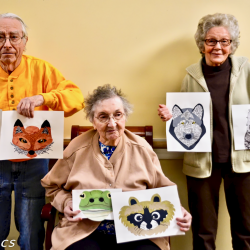 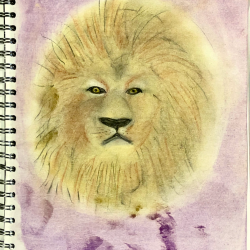 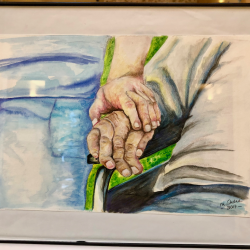 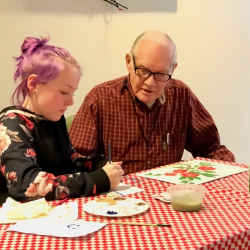 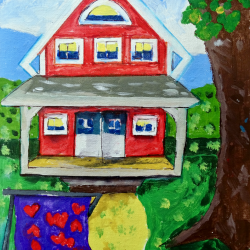 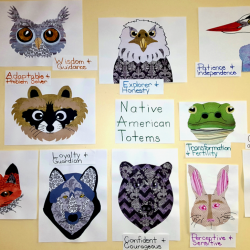 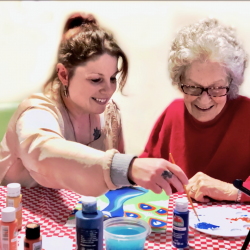 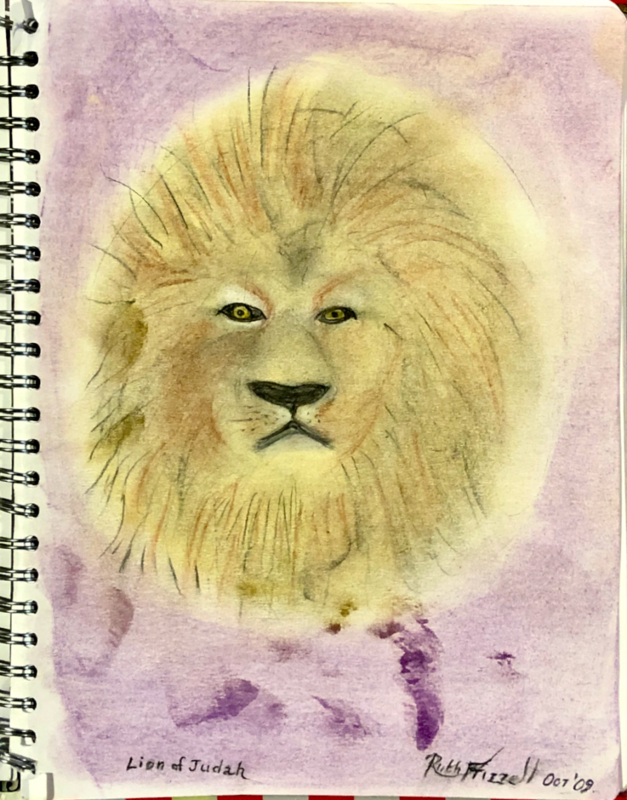 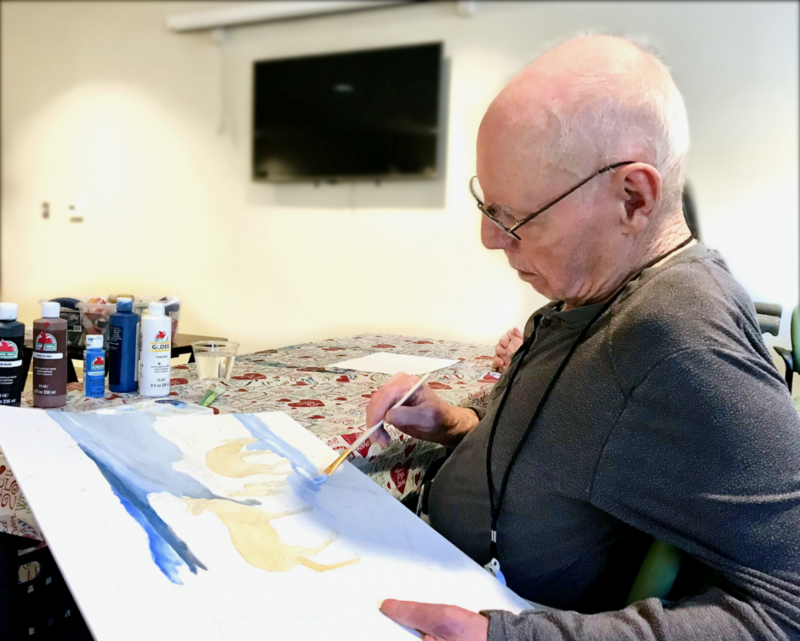 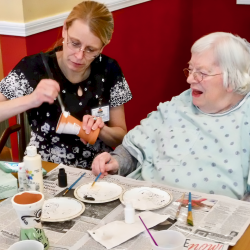 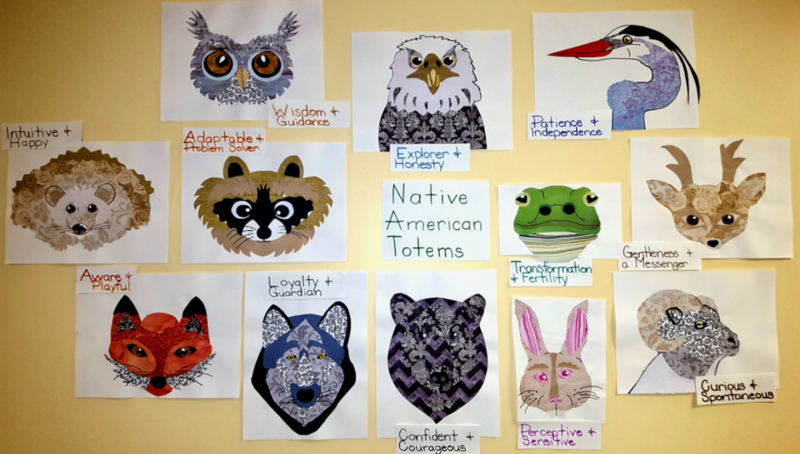 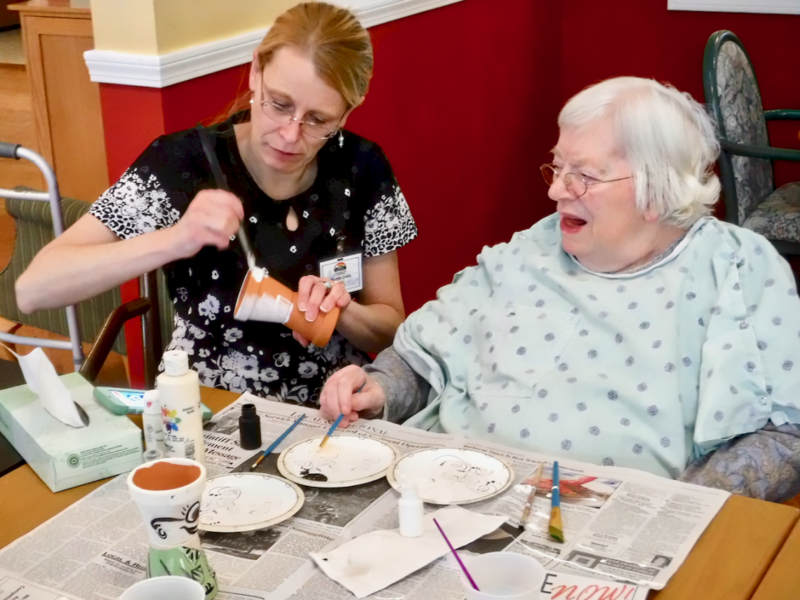 Through doing art projects, the residents build relationships with each other, experience reduced anxiety, and gain more of a sense of control over their immediate environment. 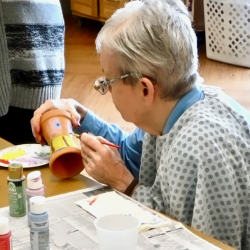 Residents have to plan, remember, create patterns and use large and fine motor skills. 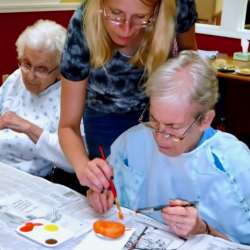 Each project provides them with a sense of purpose. 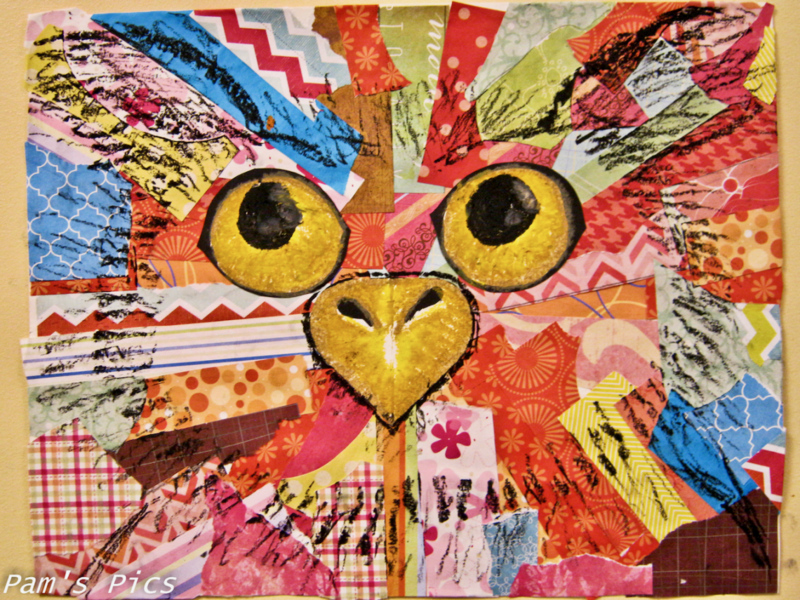 All of the materials used are washable and non-toxic. 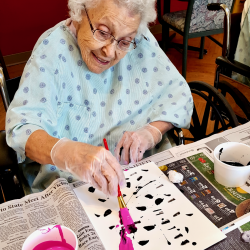 Residents recently experimented with painting Jackson Pollock style. 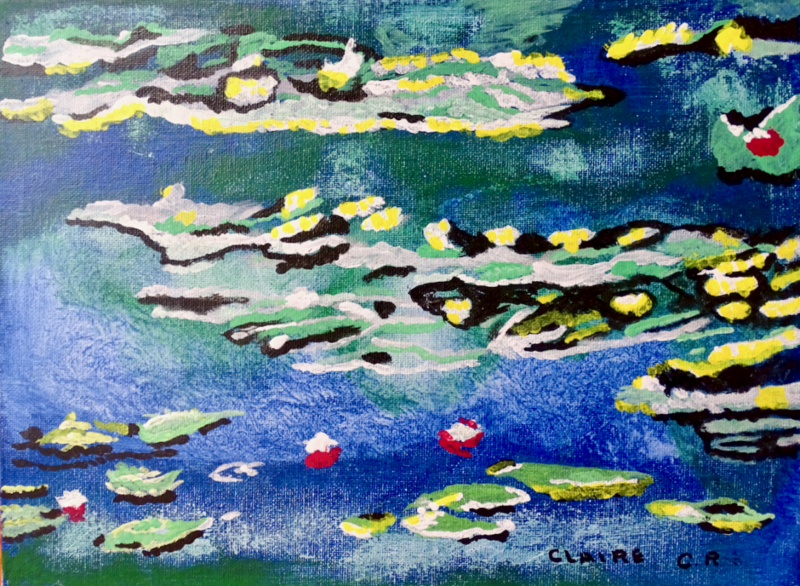 Pollock was inspired by the Navajo Sand Painters, explained Crosby. 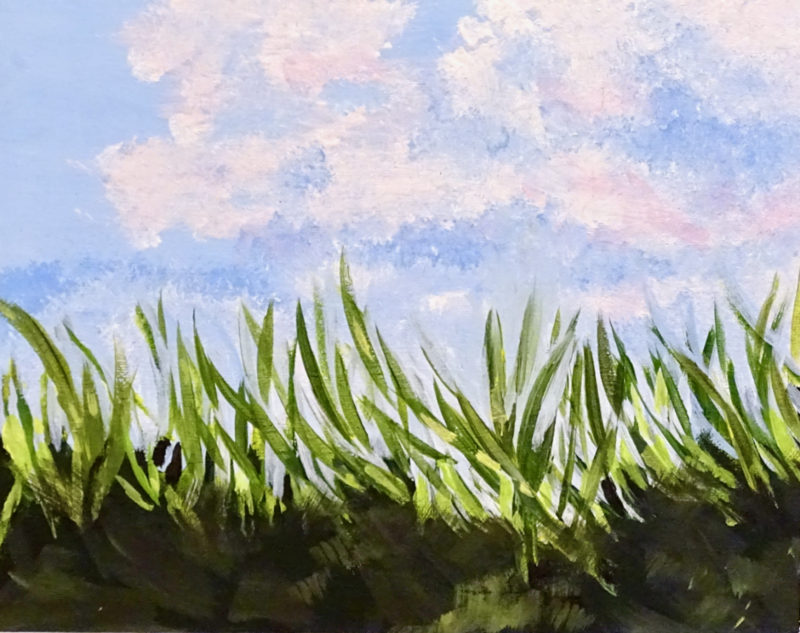 The ‘canvas’ was the ground and the emphasis was on the creating process. 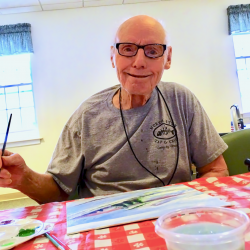 Pollock placed large canvases on the floor and used various methods of applying paint. 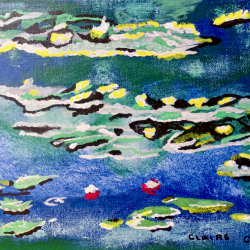 This technique was called ‘action painting’ or ‘abstract expressionism’. 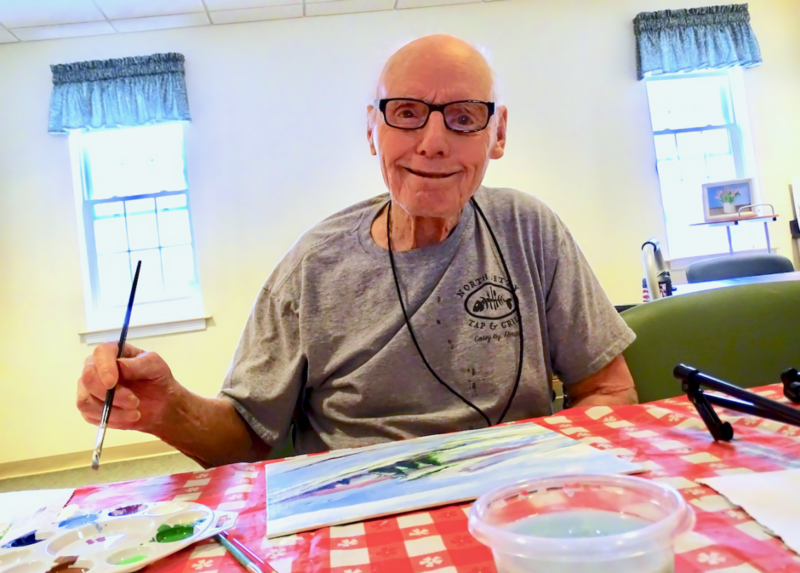 He would splash paint on the canvas using brushes, sticks, trowels, paint cans with holes in the bottom, and knives. 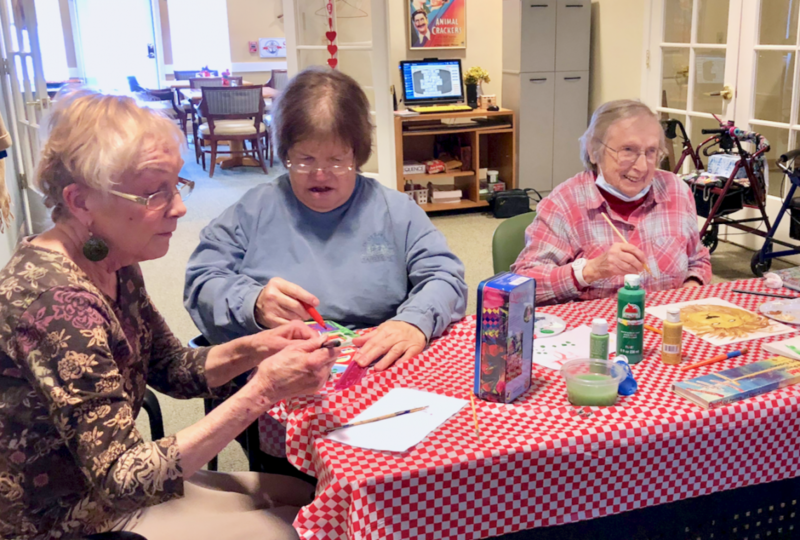 On Jackson Pollock’s birthday, Monday, January 28th, Memory Care celebrated by placing large sheets of oak tag on the floor and sprayed six different colors of paint out of baby bottles. 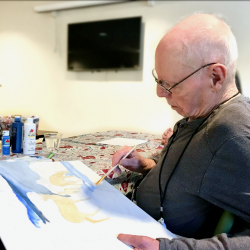 Staff and residents dressed in clothing protectors and placed their feet and legs inside garbage bags to prevent laundry disasters and then concentrated on creating art from the six colors used. 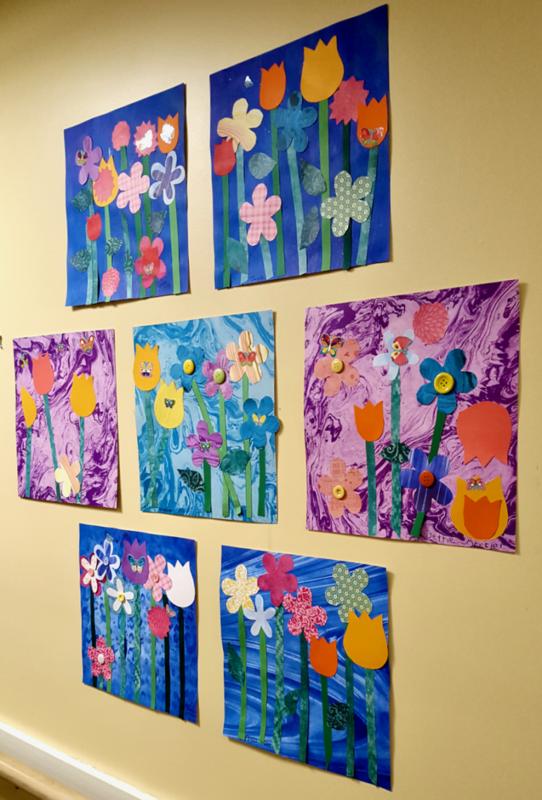 The finished masterpieces are on display in the dining rooms. 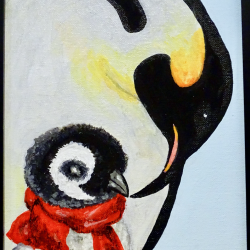 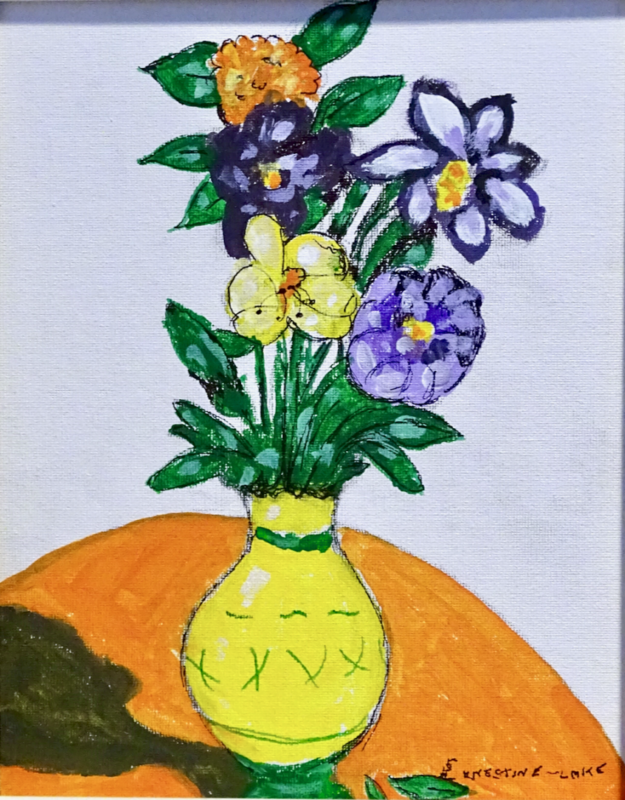 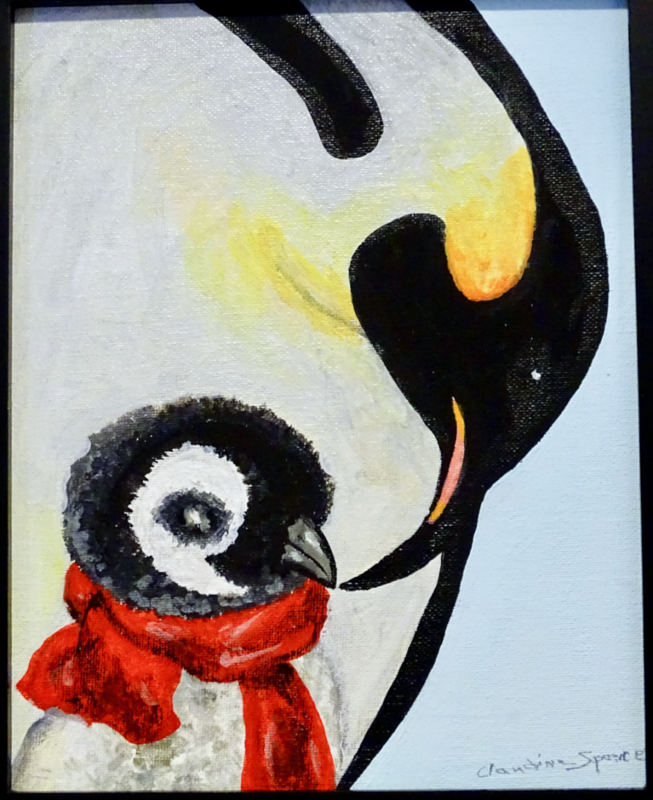 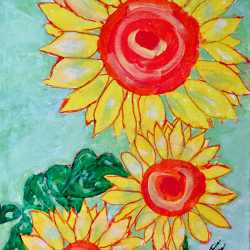 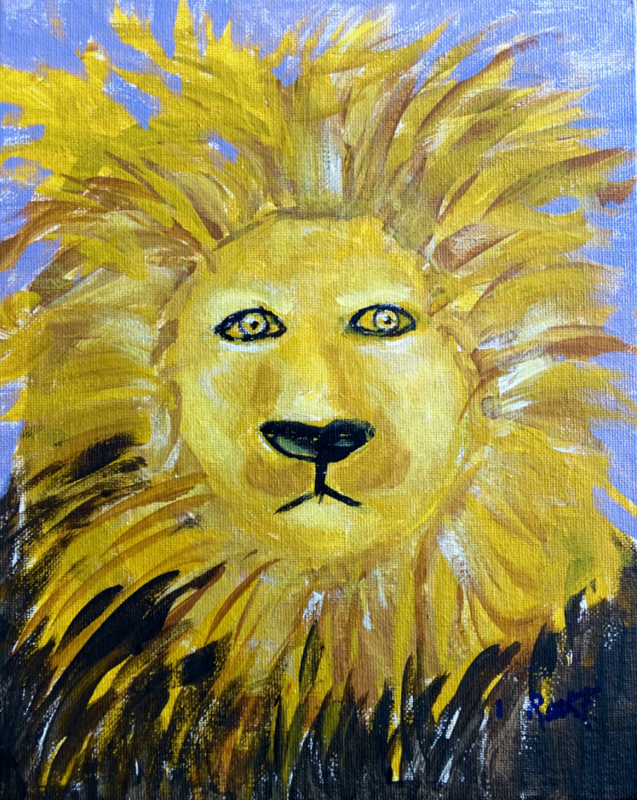 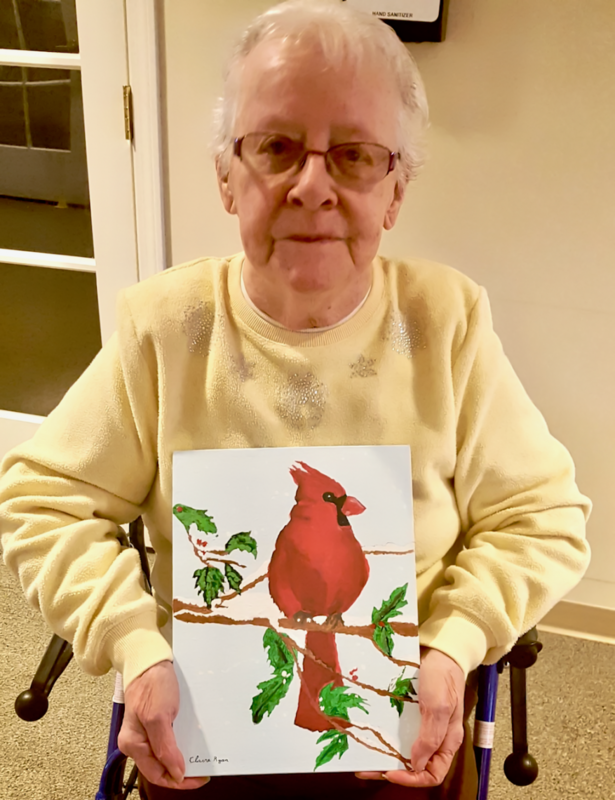 If you visit the Memory Care Center, you will also see a wide variety of art created by the residents. 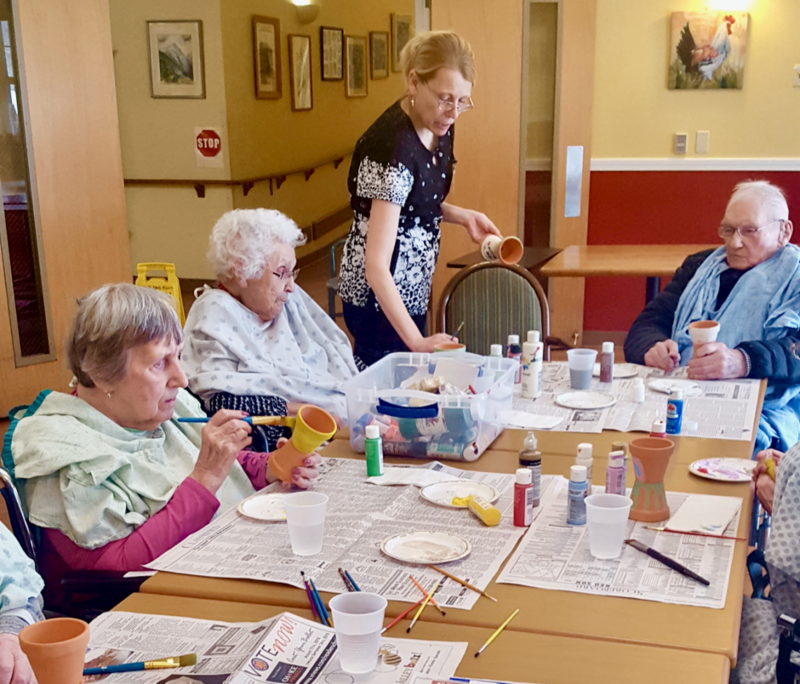 Across the driveway at Cedar Hill Health Care Center, Licensed Nursing Assistant and artist Maggie Ondre leads classes. 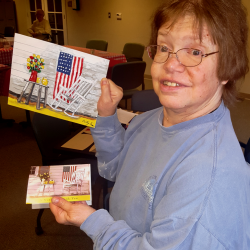 (You can see some of her own art on display at Cedar Hill.) 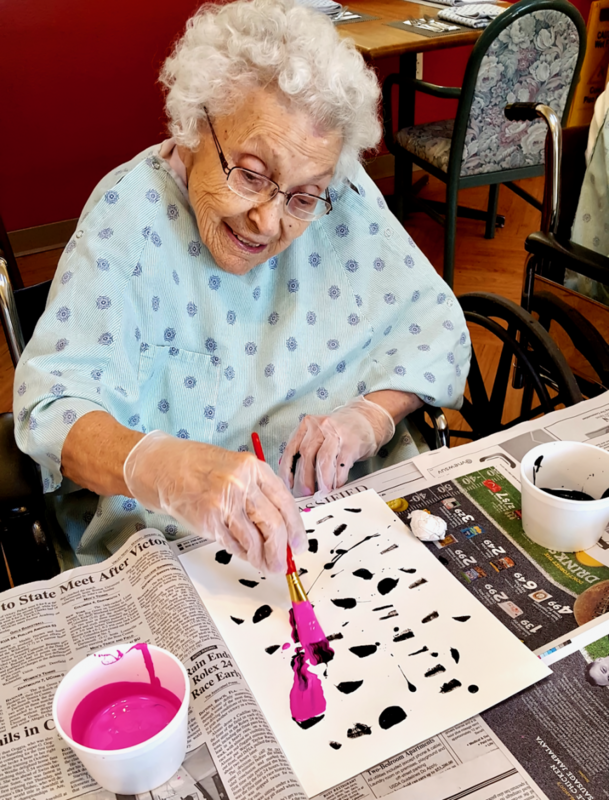 On her time off, she comes in to share her talents and do crafts with the residents. 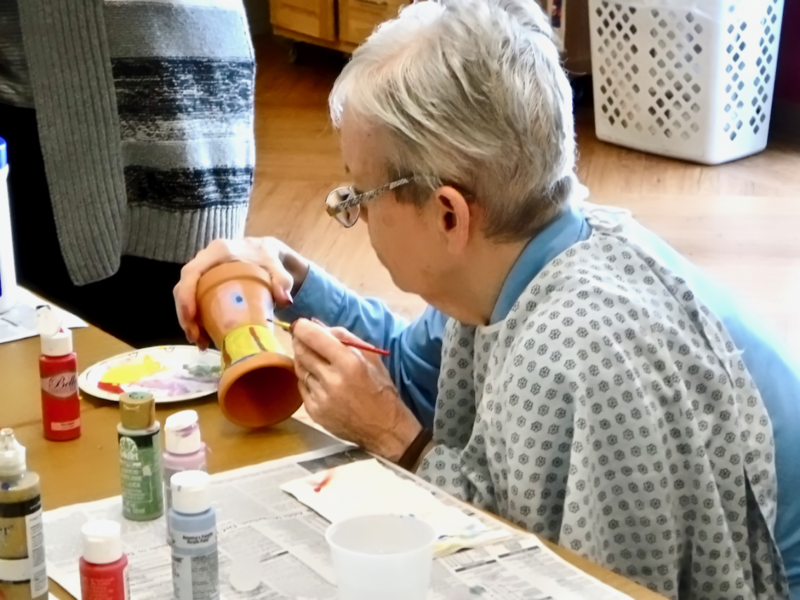 With thoughts of Spring, the residents are painting flower pots. 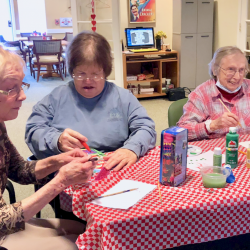 They’ve also done rock painting, made snowmen and sewing hearts for Valentine’s Day. 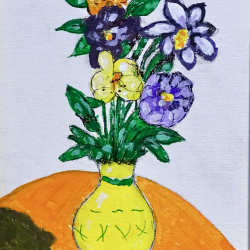 Good moods. 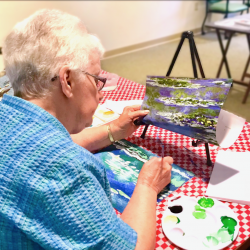 Just one of the many benefits of creating art. 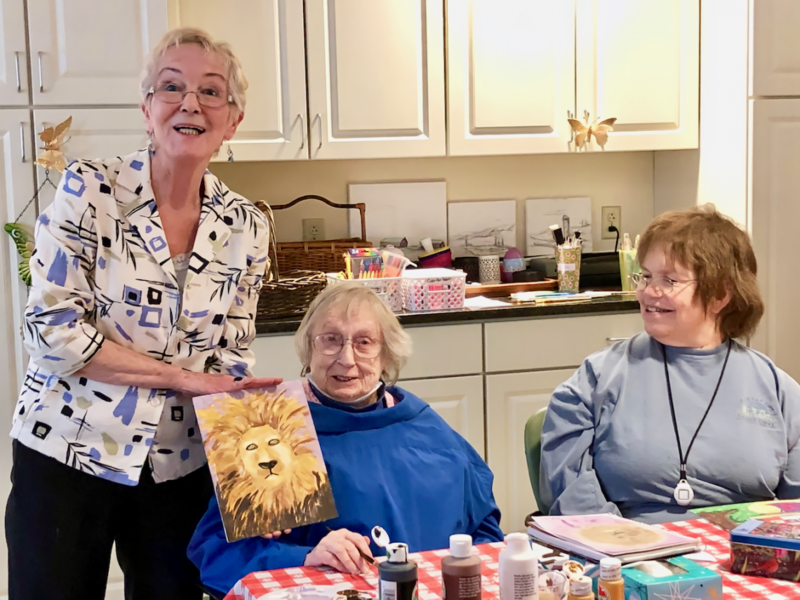 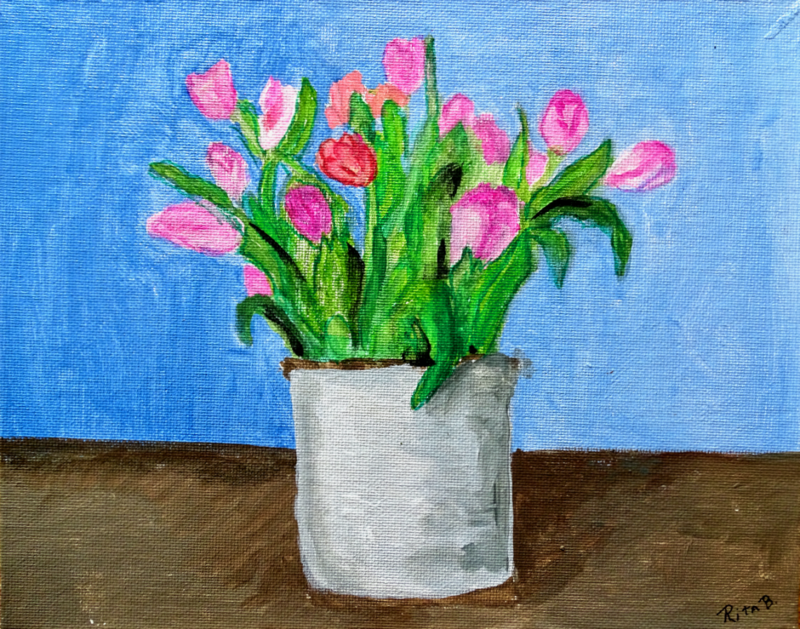 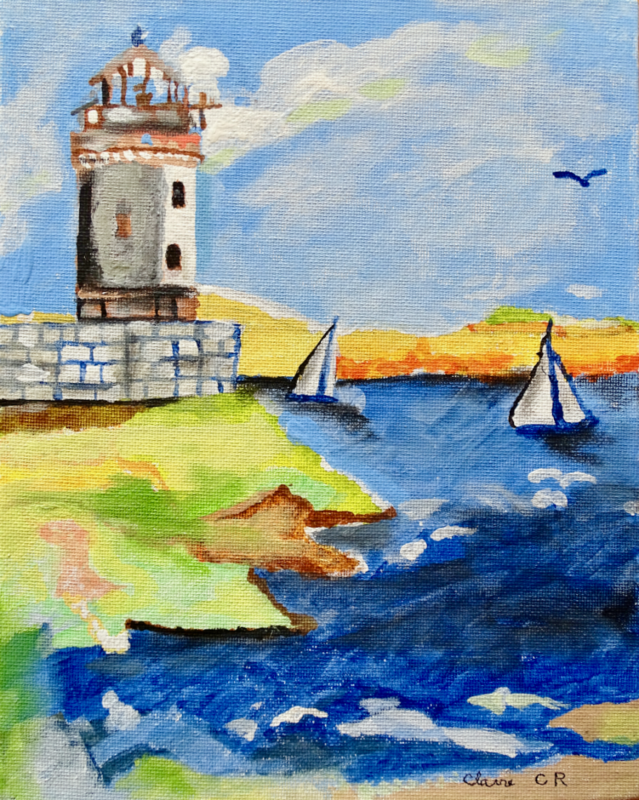 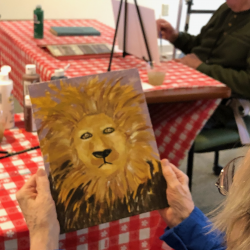 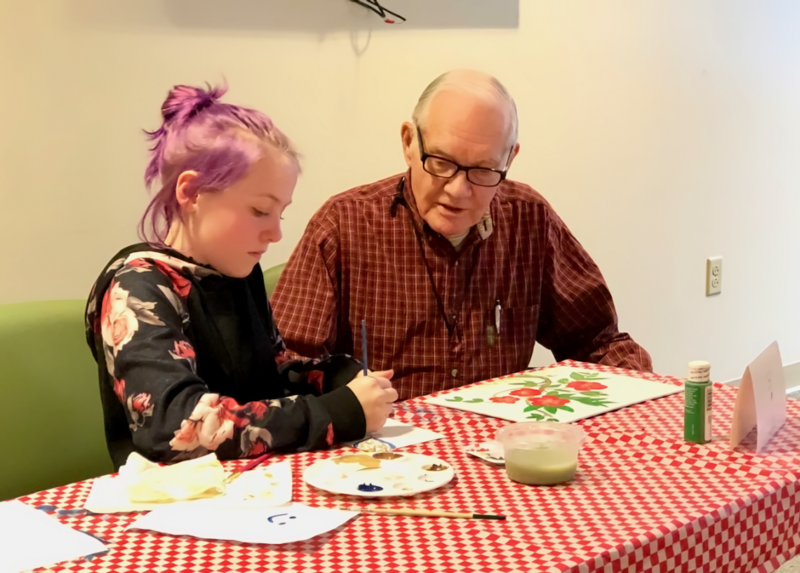 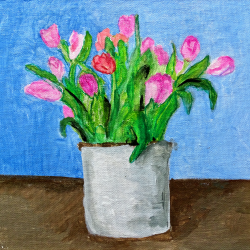 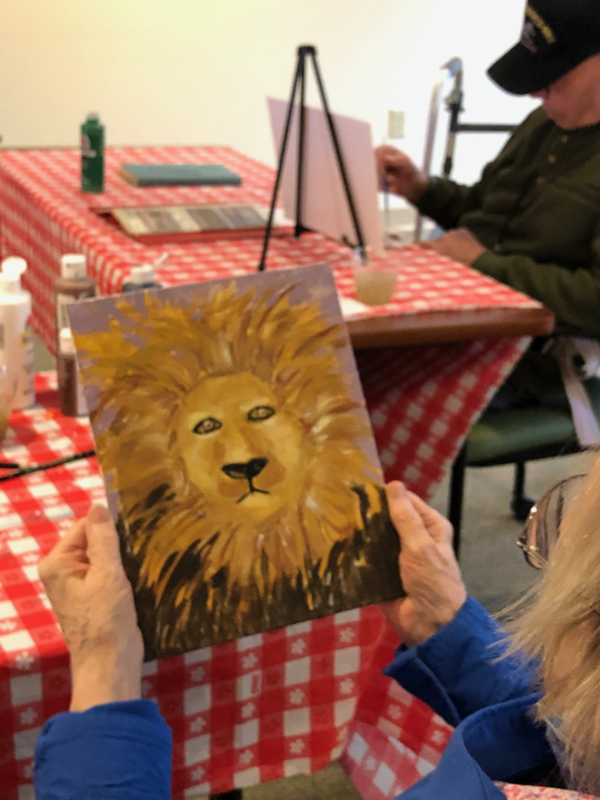 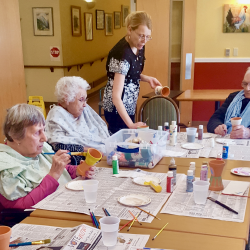 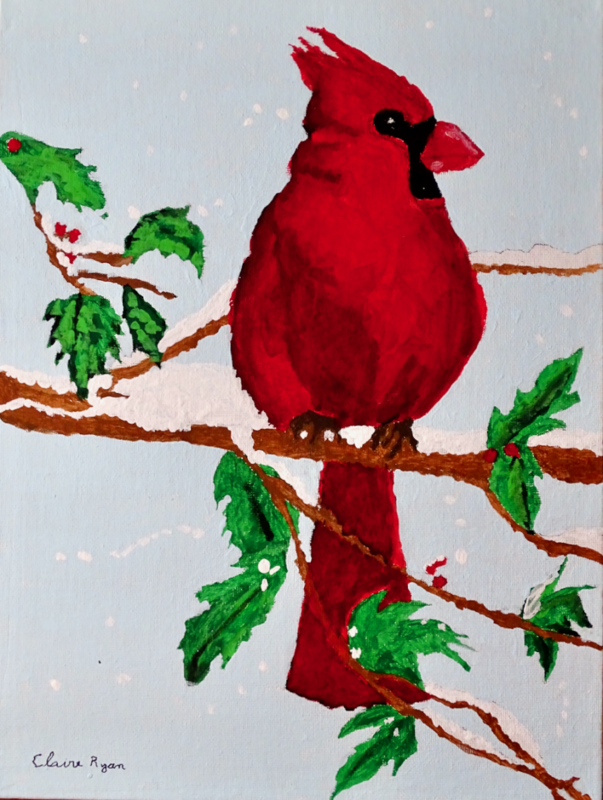 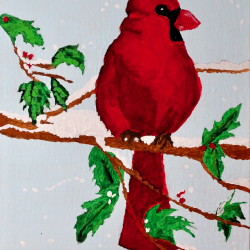 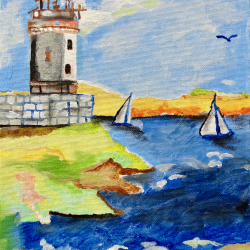 Our residents have been working with volunteer artist Kathleen Eames and with activities facilitators to create a variety of paintings on canvas and other mediums, along with handcrafted art projects. 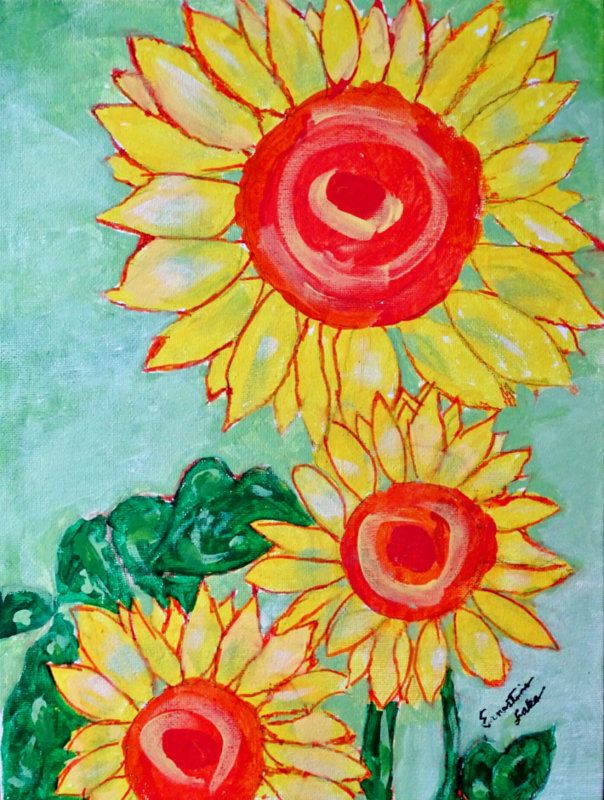 The show will be free and open to the public. 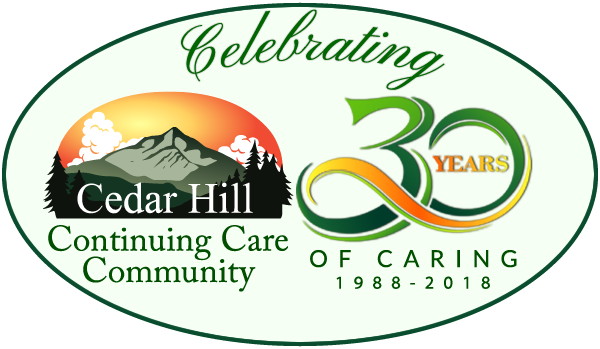 Families, friends, and members of the community are welcome to attend. 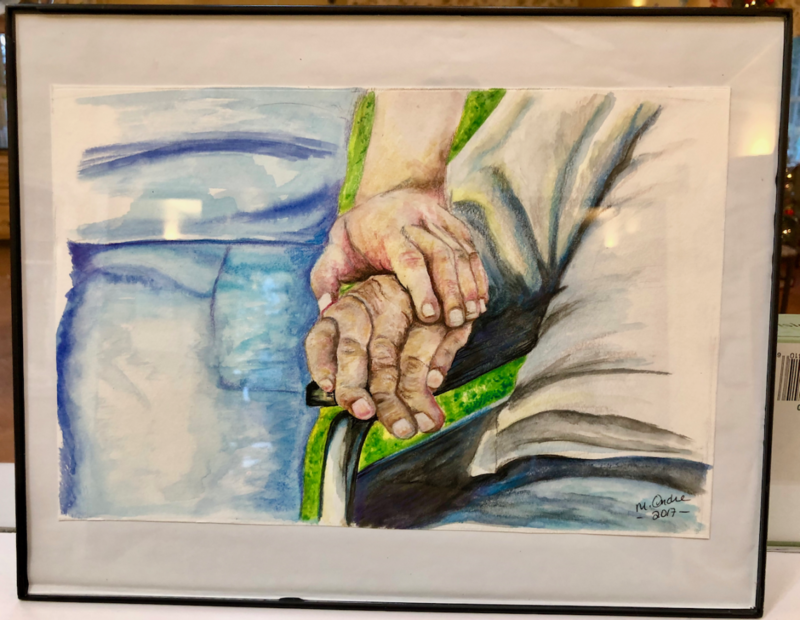 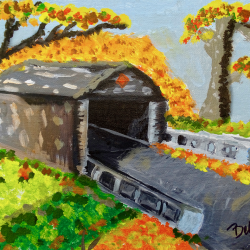 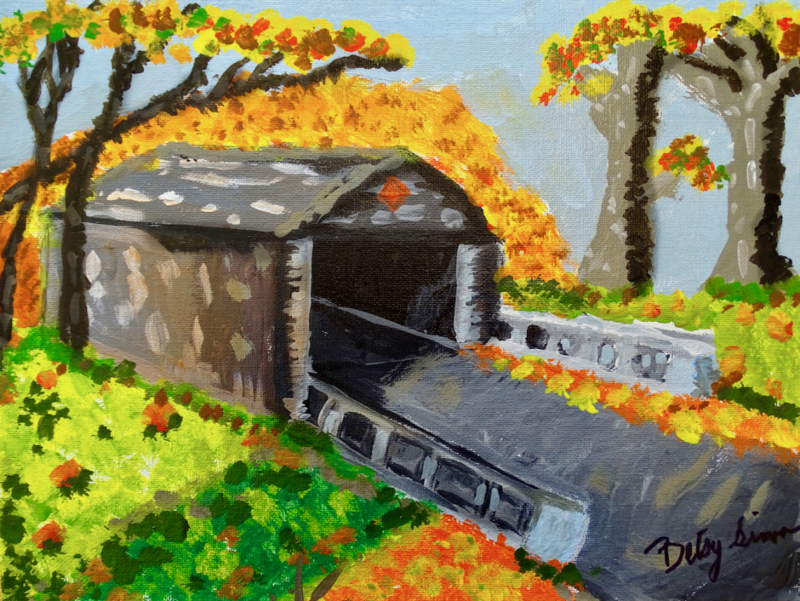 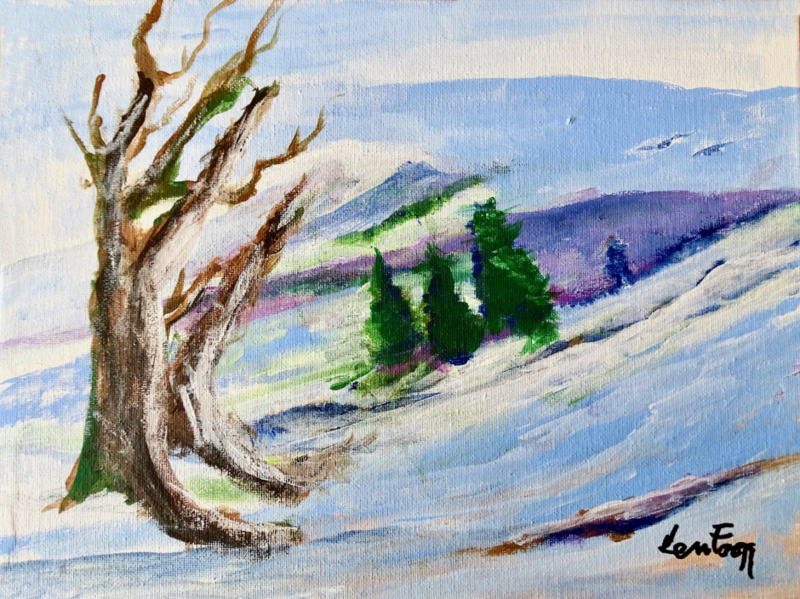 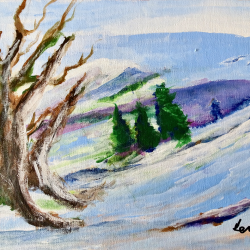 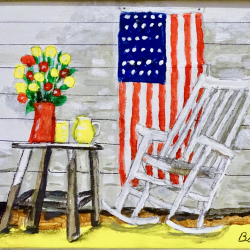 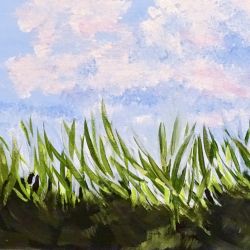 Select original works, fine prints, and note cards will be available to purchase, to benefit the Arts Program and the Entertainment Fund for all residents at The Village. 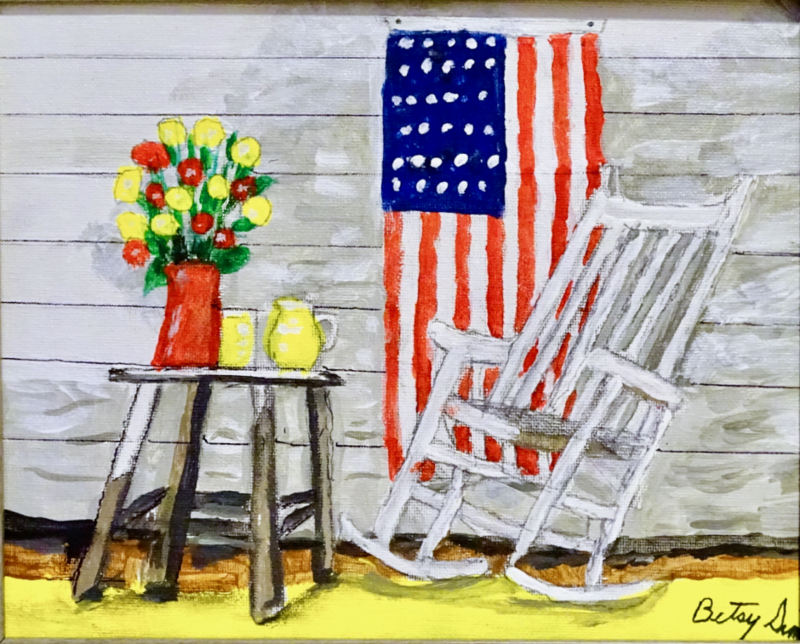 All are welcome.